Dell Technologies Capital and F-Prime Capital Partners lead funding round, helping RiskRecon continue investing in its solutions that dramatically improve the third-party risk process. 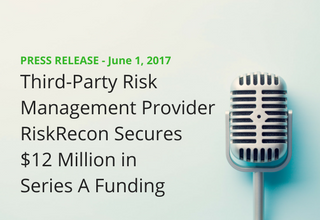 Salt Lake City, Utah (June 1, 2017) – RiskRecon, a SaaS provider of objective, vendor security assessments and insights, today announced it has completed a $12 million Series A financing round led by Dell Technologies Capital with additional participation from F-Prime Capital Partners and existing investor General Catalyst. The RiskRecon platform dramatically improves third-party risk management by delivering transparent security measurements, analytics, and analyst-level insights. The funding will bolster product development and accelerate global sales growth. With its proprietary data gathering technology, RiskRecon offers a unique depth, transparency and accuracy unavailable from security ratings services and vendor questionnaires. RiskRecon’s solution discovers a third-party vendor’s entire public IT footprint and produces actionable security assessments. RiskRecon provides not just summary information but also all supporting evidence, remediation priorities and vendor collaboration so that you can truly scale your third-party risk program. Moreover, RiskRecon’s continuous gathering of detailed IT and security data also enables clients to rapidly pinpoint third-party vendor exposure to new and emergent vulnerabilities such as Apache Struts. Through the SaaS portal, RiskRecon clients continuously monitor vendor security performance across 50 unique security criteria that map directly to industry-recognized security measurement standards and frameworks. Unlike security ratings companies, RiskRecon doesn’t settle for assessing companies from a distance, re-swizzling distant banter in chatrooms and buying data from other companies. RiskRecon believes that the best measures of security performance are those that are directly observed about a company’s infrastructure and attack surface area. The Series A funding also included existing private investors including Paul Sagan, former CEO of Akamai. RiskRecon’s SaaS solution delivers transparent security measurements, analytics, and analyst-level insight to dramatically improve your third-party risk management program. Using innovative data gathering and analysis techniques, we provide unique insights into the risk reality of your increasingly interconnected organization. Clients rely on RiskRecon to bring greater transparency, accountability and collaboration to their vulnerability and third-party risk management processes. And, they trust that RiskRecon’s continuous monitoring solution provides the necessary accuracy and actionable evidence to properly scale their risk program. Learn more at www.riskrecon.com.